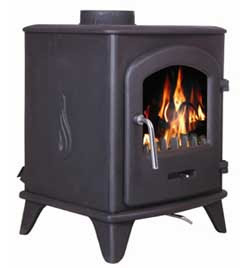 In the last couple of months, we've heard and written about lots of DEFRA approved stoves for use in smoke control areas and also received a number of emails asking for guidance of what can and can't be done when burning logs. Unfortunately we're not complete experts in the subject (but we're learning) but having spoken to a number of experts in the field we have quickly learned that we should get our terminology correct. There's no such thing as smoke control 'approval'. Assuming an appliance satisfies DEFRA's test requirements, it becomes 'exempt'. On a similar basis, a fuel meeting DEFRA requirements becomes 'authorised'. Assuming it is not against the guidance of the manufacturer, you can burn any 'authorised' fuels in any stove or fireplace in a smoke control area. BUT, and it's a big but, the list of DEFRA 'authorised' fuels does not include wood logs, so if you want to burn wood logs in a smoke control area, you must use a DEFRA 'exempt' appliance. We strongly recommend you look at www.uksmokecontrolareas.co.uk which provides detailed and in-depth detail of the legislative background to the UK smoke control areas, the general locations of the smoke control areas and list of both exempt appliances and authorised fuels.